The story of Hemingway's first marriage to Richardson in Jazz Age Paris surrounded by glittering friends such as Gertrude Stein and, yes, Scott and Zelda. 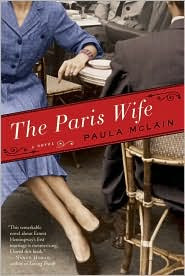 The Paris Wife is among Nicole Hill's five top books that are like country and western songs and Wai Chee Dimock's five top books on Hemingway in Paris; it made Kirkus Reviews list of the best historical fiction titles of 2011. The Page 69 Test: The Paris Wife.